Here are the 2017 rank requirements in an online Google spreadsheet, which can then be shared with parents and troop members online. Create a Google account and login. Create a Google spreadsheet, then use the File menu for "import". Choose "upload" to upload the file that is downloaded above. Change the "share" permission to "view only" for visitors. ﻿﻿﻿Using drive.google.com, you can import this spreadsheet and make a copy of the spreadsheet for each of your scouts. Each scout will have a unique URL to his own spreadsheet to update it in preparation for counselor meetings. To create a shareable link, use the "share" permission for "get shareable link" and use the setting "anyone can edit". To duplicate the spreadsheet, use "make a copy" in the file menu. Alternatively, you can create a folder with the permission "anyone can edit" and then place the spreadsheet in it (using the file menu, "move to folder"). From the folder view, right click on the spreadsheet and choose "make a copy". Then right click on the new file to rename it to the name of the scout. Last updated in 2017. This online spreadsheet is intended for Google Docs, and it can be used to generate an Interest Survey for potential counselors. 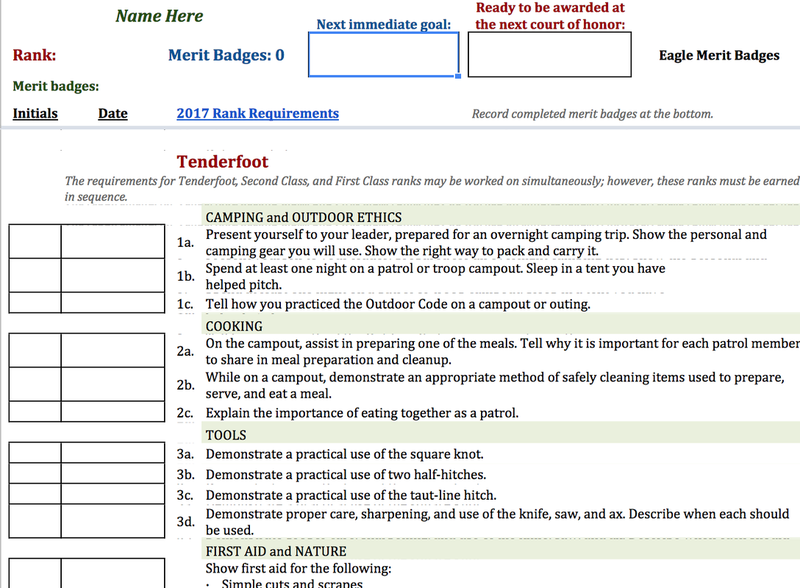 Not only does it track your troop's private registered merit badge counselor list, but there are instructions to email a quick sign-up list to others, showing the needs of the troop. Note: to add this to drive.google.com, first create a Google account, then create a Google spreadsheet, then use the File menu for "import". Choose "upload" and upload the file you download here to create a new spreadsheet. Not intended for Excel.